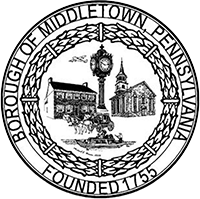 The Borough of Middletown will be accepting bids to provide grass cutting, trimming and clipping removal for approximately 58 properties. Bids will be received at the Borough Municipal Building, 60 W. Emaus Street, Middletown, PA 17057 until NOON, on April 17, 2017, at which time they will be publicly opened and read aloud. The Borough reserves the right to reject any or all bids, to waive any technical defects, and to accept any bid that it may deem to be in the best interest of the Borough. Bidding documents and specifications may be examined and obtained at the Borough Municipal Building at the address listed above Monday through Friday from 8:00 AM. to 4:30 P.M. Prospective bidders are advised that there will be a MANDATORY pre-bid conference in Council Chambers at the Municipal Building, 60 W. Emaus Street, Middletown on April 5, 2017 at l P.M. All interested bidders must attend this conference.